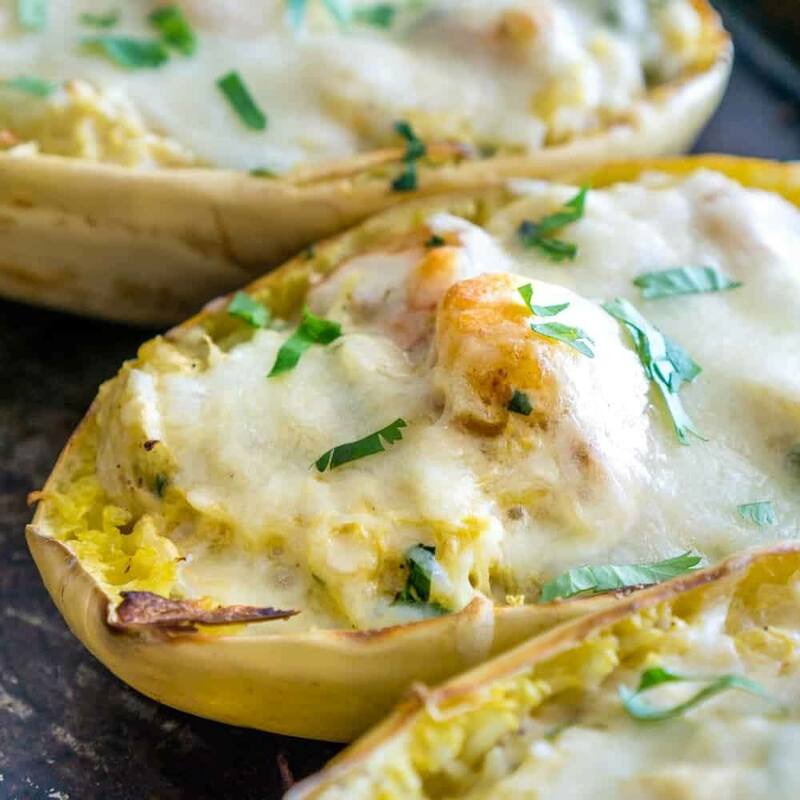 Rich and creamy Shrimp Alfredo baked in Spaghetti Squash Boats is the ultimate low carb keto comfort food. Get the tips for how to make this dish quickly. Preheat oven to 375F. Cut the spaghetti squash in half length-wise. Use a spoon to scoop out the seeds. Brush the inside of each half with half the olive oil, and season with salt and pepper. Place on a large baking sheet with the cut side facing up. Season with salt and pepper. Roast the squash at 375F for about 30 minutes, or until the squash flakes easily when pierced with a fork. Set aside to cool for a few minutes, but keep the oven on - you'll need it in a few minutes. Use a fork to scrape all the spaghetti squash strands out of each squash, taking care not to pierce the squash skin (read the recipe post for tips for flaking the squash, and what to do if you pierce the skin!). Place the spaghetti strands into a large bowl. While the spaghetti squash is roasting, prepare the rest of the ingredients: Chop the herbs. Grate the cheese. In a medium bowl, combine the peeled, thawed shrimp with the salt, garlic powder, paprika, and 1 tablespoon olive oil. Mix with a fork. Heat a large skillet, and add the shrimp to the skillet in a single layer. Cook for 2 minutes, then use tongs to flip each shrimp over. Cook for another 2 minutes, or until the shrimp are fully cooked. Remove from heat. In a large bowl, combine the cooked spaghetti squash, cooked shrimp, 1.5 cups Alfredo sauce, 1/4 cup grated Parmesan cheese, and the herbs. Mix well, and place into the 4 spaghetti squash boat shells. Arrange the spaghetti squash boats on the same large baking sheet. Top each filled spaghetti squash boat with about a tablespoon of freshly grated Parmesan cheese, and about 1/4 cup shredded mozzarella. Bake at 375F for 10-15 minutes, or until the cheese is all melted. Remove from heat, allow to stand for 5 minutes before serving hot.